Almost heart attack la hahaha! Yay ME FC!!!!! After a looooooong time of not chopping! Wait ah.... lemme do my FC dance first cause long time didn get to chop! Hhahahahahha helllloooo Lina, I was stalking!!! I think they're thin cause do a lot of walking... we all always drive everywhere eh? LOL @ not having anything against fat ppl, funny la u! wah..first seven minutes also got 12 comments already.. yo.. who can beat that!! malaysia that open like thailand? no way,, man... no way!!! I have never been to Thailand but looking forward to the cheap shopping and food which I have heard so much about it. The last I was in Thailand,it was only across the border. I didn't even get to say, I went to Bangkok. oh well :P.
Thai are open indeed.. afterall that it their tourist attraction. In Malaysia, there are restrictions so it is harder to be open. Eve if that happens, something bad might happen to the erson trying. But that is us the tourist side looking at it. eventually, their own people ay think otherwise. Malaysia how to be open if Beyonce had trouble performing here, right? That tom yam looks delicious! I agree though. But there ARE Thai who are rude. Just like M'sians. We're considered okay .... just that it takes time for us to warm up to each other. dont know when im gonna visit that country again..
Maybe I should go to Thailand one day. My last visit there was when I was a child and someone pick pocket the money from my father. That bad impression still last. Haha, ya I realise that Thai gals are very gentle, no wonder the angmohs like them so much. But some of the gals look so skinny, that I wonder if its the Tom yam goong, or malnutrition. And Bangkok is so tourist-friendly, that I feel like a king when I go there. They are friendly, polite, repect and Nice! well..i've worked with some thai folks and they are very friendly, soft spoken, polite folks! Wow, spammed my blog to your heart's content, eh? Well, good for you! Now, when can I ever be FC on your blog? Haha, the men sound not macho? I didn't really notice that! You are right - Beyonce also cannot perform here, how to be open like Thailand? Impossible! Yeah, I feel like a celebrity now being stalked, haha! J2Kfm, yes Malaysians takes time to warm up to, but Thais are instant warm up! Of course there are always the rude ones - you can find that in any country. shingo T, yes the girls are very gentle that's why lots of angmohs like. Not only angmohs, but Malaysian men too! No idea why some are so skinny, maybe don't eat enough? The traffic of some of Taipei's area is just like that first photo, jammed with vehicles, cars, buses and scooters. That shrimp meal looks so delicious and I believe they make very fine food. Yeah! Certainly not Malaysia. :p So you have been to Thailand before lar? Mai Phen Rai? Ouh...yeah, I learn a new phrase today. This is a good attitude. Despite their harsh living surrounding they still manage to live in their own means....not like us malaysian..complain here and there. Anyway thanks for sharing bro. Have a great day. 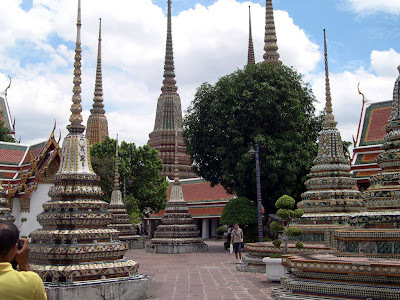 Why suddenly you write about Thailand? Is this the country you are going to visit, with your blogger friend? Malaysian beaches are as good as, if not better than, those in Thailand. Yet most Westerners prefer to visit Land of Smile. Go figure out. Thais are very liberal towards gays and transvestites. Some Westerners attribute their attitude to their Buddhist upbringing. Unlike Bible, Buddhist scriptures haven't condemned homosexuality. So you change strategy, so unpredictable now. Whoa love the aTOMic YAM very much. Traffic jam is a trademark already and one of the tourist attraction of Thailand, haha. About the traffic in bangkok my bestfriend told me about it during her trip, she said it's even worse than Manila. I haven't relly toured in Thailand, hopefully in the future. I like Bangkok and would like to go back there again in the near future as well as the northern province such as Chiang Mai. Not to forget is the Koh Samui. You join me? And ya, you are right on Thai people being the most gentle and friendliest. I had stayed 1 full year with Thai people during my university years. And I agree I am much more aggressive than my housemates, haha! I like Thai food to the most. I used to have Thai cuisine everyday as my Thai housemates cooked for me! You will amaze at how many types of curry they have, namely Tom Yam, green curry, yellow curry, red curry, just to name a few. 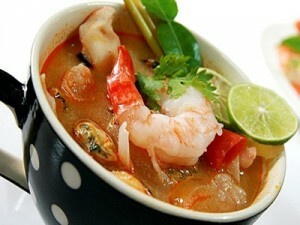 This year never been to BKK, nice food, yeah TomYam Goong is a must. Ladies would love the leather goods and Msia to be like Thailand? 101% "NO WAY" coz firstly spelling not the same even though gomen tried to add the '1' infront and nothing to comment further as you guys have said it all, loud and clear. i honestly think that thais are much better than malaysians. at least they are polite! and much less discrimination there. is it because people who are less wealthy are happy people? Thai food is indeed delicious, that is if you know what to order here and that the cooks are authentic Thais. The best Thai food I have ever tasted is at Rama V. The restaurant is at the U Thant area in a converted bungalow. I too have heard something not much about Thailand that it's just a wonder, and people are as amazing! Have only been to Haadyai and no intention to go Thailand in the near future. Thailand is a nice place for food and shopping. Just love the wholesale market! Thailand is a nice place for cheap food and shop but definitely not the quality of life. manglish, really? You think you are Thai in previous life? Hmmm, interesting. tekkaus, yes been to Thailand and loved it! No, I don't think you can ban the usage of horn as it is important to use them when necessary. 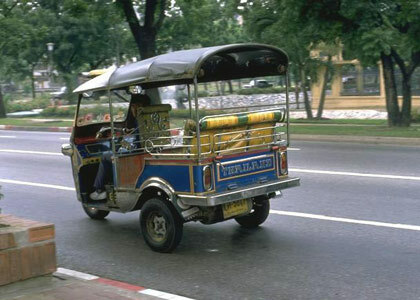 I just noticed the Thai drivers use their horn very sparingly and only if necessary unlike Malaysians who horn for every little bit of thing and mostly unnecessarily! Black magic? No lah, they are slim because of their food and physical activity and of course, they don't go on a 24-hour food binging like us! LOL! Yeah, even though Malaysian beaches are better, we lack the hospitality and good service the Thai people hprovide. That's where we lost out to Thailand in terms of tourism! happysurfer, oh I have never been to Rama V. Must try it one day! Yes, authentic Thai dishes are really good, not the watered down versions in Malaysian Thai restaurants! happysurfer, btw, I noticed a huge difference in quality between food served in Malaysian's Black Canyon Coffee compared to Thai's. Black Canyon is a Thai restaurant and I enjoyed their food in Bangkok, but found it lousy in the Malaysian outlets. 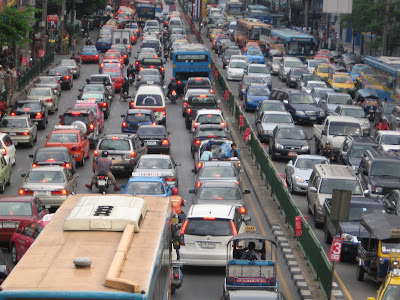 bangkok is a great place for shopping and food but the traffic congestion is out of the question. it's worse than KL. faisal, haha! Put on a good deodorant to prevent the body odor!